It was 1977 when Maureen Robinson joined DCL’s (Distillers Company Ltd’s) Glenochil Research Station, after studying pharmacy at Strathclyde University. 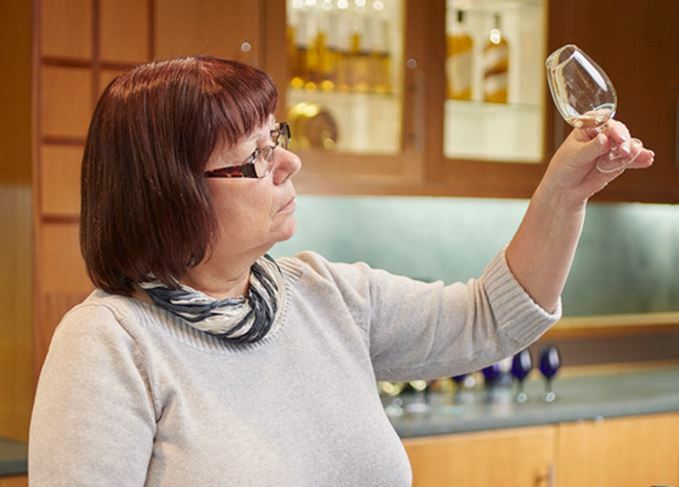 Over the years, she has created many legendary blends and single malts, and developed a language to describe new make and mature whisky. ‘She has an unbelievable knowledge,’ says one of her colleagues. ‘It’s uncanny what she understands about the whiskies in our stocks.’ In the week of her 40th anniversary, Dave Broom sat down with Maureen Robinson to talk desert island drams, flavour and how to blend in your hotel room. ‘Everything has escalated in size since I started. In DCL (Distillers Company Ltd) days, we were almost working at a gentle pace, but the forming of Diageo saw three whisky firms (DCL, Bell’s and International Distillers & Vintners) joining together. In blending, we always said that there were never enough hours in the day after Turnbull Hutton [former MD of distillation and spirit supply] took over. ‘When we use the term “stocks” we don’t mean knowing how many casks we have, but understanding the flavours of each distillery and how things evolve and change over time – so you know what Cardhu, for example, is like at five and then 10. It’s about understanding the future. Innovation comes out of only having a certain amount of stock. Because demand changes all the time, it’s all about playing tunes with different things to satisfy everybody. ‘We have to have the right flavours at the right scale, which is why it’s so important to have conversations with all parts of the business. If they don’t do what we want from a flavour perspective, it makes our lives more difficult. ‘Our old classification for malts was Highland, Lowland, etc, but within Highland you had first, second and third class, and then “A” and “B” within those – one was lighter, another was heavier. It made more sense to go down the route of flavour, so I came up with a new classification. ‘Then we went further into flavour, which is where we got our categories one to six, and then the different makes within each of those. Each individual distillery is different, but this allows you to play around with them and tweak them. You know what that Cardhu five is like, but if that drops away, then you can find an alternative. ‘I remember someone asking me about Blue Label… no, it was The John Walker, and they were trying to tease out of me how I put it together and… you just do it! You have all these things in your head. That’s how you start on a new blend. ‘First, you work out what you want to do, then you put it on paper, then you bring in the samples and try to make what you had on paper. Then you say: “That’s not what I wanted,” and you just play around with it. ‘Without having that background knowledge you are flying blind. So it’s experience and it’s also building up your own language. As a team, we will all pick up different things, but that’s OK as long as you are consistent when you nose something and with the language you use to describe it. ‘The good thing with innovation is that you are involved right from the start. Someone in the market comes up with an idea and you get involved right away with developing the concept because you know the liquid. It’s the liquid which helps craft the concept. ‘You’re not creating a new whisky for yourself, but for the consumer, so you ask about their palate. I’ve been out on the market and you listen to what consumers say. You have your kit with you, and so you go back to the hotel and play about with stuff in your bedroom to get whisky ready for the next day. I used to think that hotel staff might think I had a drink problem because I’d put all the whisky down the sink and just leave the empty bottles. ‘I think the first blend I did which I saw on the market was Old Parr Elizabethan. I was on my way to Australia, via Singapore, and I was in duty free, and there’s this bottle. It was the first time I’d seen it. I’ve actually got a photo of me and my daughter standing beside it. ‘I was involved in most blends until 2010 when I moved more towards malts – though I’d worked with them before as I’d been responsible for all the quality assurance in 1997. One of the first I worked on was the Classic Six. In those days, it was for connoisseurs, and Cardhu was for an intimate dinner for two. They were going to do a big play on Glen Ord as well. It was thought to be for the male palate at that time. ‘In single malt I probably lean more towards a distillery character than wood. I’m not a Sherry cask person. I don’t mind it in a blend, but I only like it in a malt if it is balanced with refill and other woods. ‘Essentially, putting a single malt together is the same as making a blend, but it’s more intense. You still have to be sure that no one flavour is dominating, and it could be more difficult with malts because you only have one distillery and different woods, whereas with a blend you have different distilleries and different woods. To me, a blend is slightly easier. With a malt you are slightly more exposed. ‘As blenders our lives might be a little easier now compared to when I started. All that work in distillation and wood has been going on parallel to what we have been doing. We understand wood and maturation better. Before, all you had was refill, Bourbon and Sherry. Now you have toasted, rejuvenated, double charred ends – all kinds of stuff. It’s given us more scope. ‘I think we’re at the start of being able to look into the future and create new flavours, while still keeping within the rules. There’s so much science you can fall back on to do certain things with yeast or wood.